The north of Thailand contrasts greatly with the busy city of Bangkok and the high energy beach resorts of the south. The main destination is the ancient capital of the northern kingdom of "Lanna," Chiang Mai. The city recently celebrated the 700th anniversary of its founding. The original city is still defined by a square perimeter wall surrounded by a moat. Within and without are a number of temples, some of which date to the city's founding. Chiang Mai is home to many factories for the manufacture of silks, lacquerware, silver and other traditional crafts. The factories can be toured in the daytime, and a wide variety of goods may be purchased at the city's famous night bazaar. The best places to stay are, in fact, all within walking distance of the night bazaar. Click on any of the labels for more information. 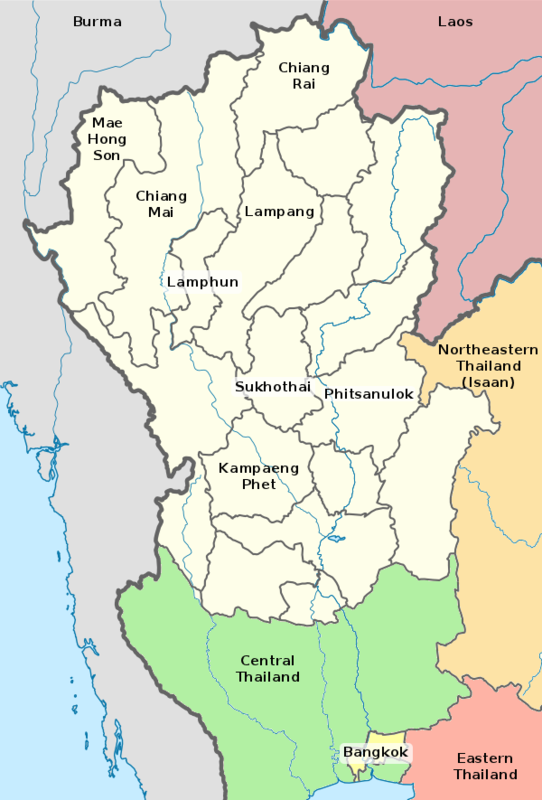 Other popular destinations in the north include the smaller cities of Chiang Rai and Mae Hong Son. Chiang Rai is the gateway to the "Golden Triangle" region. Thai Airways flies to both destinations, though often through Chiang Mai. Its not quite the adventure it used to be, since everyone is doing it. You'll find companies offering trekking tours in all major cities in the north. Here's a run-down of the major attractions of Northern Thailand. You will note from the map above that many of these sights lie along a line north from Bangkok. Its quite reasonable, if you have the time, to spend up to a day in each city before moving on to the next. Chiang Rai has replaced Chiang Mai to some degree as a chill-out place. The two cities are almost the same age, but Chiang Rai's history is not as evident as Chiang Mai's. Still, there are several interesting places in the area, making Chiang Rai an excellent base for exploring the "golden triangle." The northern-most town in Thailand, right on the Burmese border. A small stream separates the two countries at this point. As one of the few official crossing points, the town is a good place to browse for Burmese goods such as jade, lacquerware, etc. About 20 miles from Chiang Rai on the banks of the Maekong, this fourteenth century town still has some ruins of interest. There's a national museum here as well. Kamphaeng Phet dates from the time of the thirteenth century kingdom of Sukhothai. The ruins of the walled city are interesting, but not spectacular. Kamphaeng Phet makes a good place to spend the night if driving to Chiang Mai. Lamphun is only a short distance from Chiang Mai town. Its easily taken in during a day trip from Chiang Mai. There are also several craft villages between Chiang Mai and Lamphun, so you can squeeze in some shopping along with sightseeing. This temple, dating from the twelfth century, has a beautiful large chedi in the "Hariphunchai" style. Its nearly 150 feet tall and covered in gold. Behind the temple is a national museum. The main attraction to Mae Hong Son is its location. High up in the mountains on the Burmese border, surrounded by forests, the town is a cool retreat far away from the crowds. The province is a major jumping-off point for trekking. The rather small town of Sukhothai now has its own airport. If you're looking for someplace different to spend a few days, you could do worse than to establish yourself in one of the many new hotels and spend some time exploring Thailand's first capitol. The thirteenth century kingdom of Sukhothai is considered the first Thai kingdom. This historical park houses the ruins of several temples as well as a national museum. This outpost of the Sukhothai kingdom is attractively set among some hills. There's an interesting "elephant temple" which is well preserved.